You have an angry mob to feed on games night, what to do? Have no fear, we at Board Together are here . . . 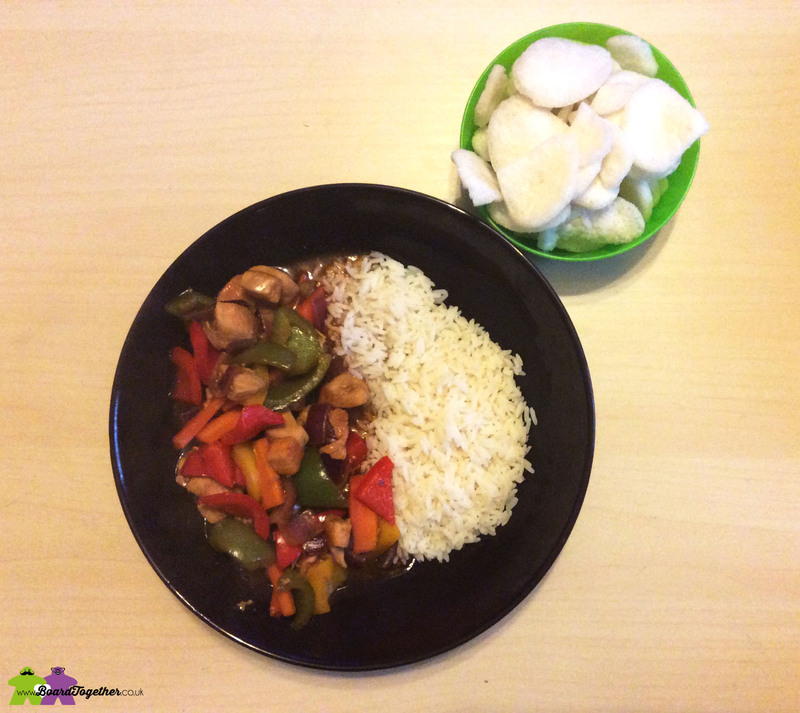 This Sweet & Sour Chicken recipe is so good your friends will think it is from the local takeaway! Not only does it taste great, it is very versatile. We understand everyone’s tastes are different, so feel free to tweak the sauce ingredients as you go. We really do recommend you taste it as you cook so you can change it. You can also add some more vegetables and leave out the meat for vegetarian friends. Check how to cook your rice. We go for Uncle Ben’s Boil in a Bag that takes 10minutes and it goes in after step 5, once we add the vegetables, you may need to cook yours longer, so start now. Chop chicken into bitesized chunks and pop in a large saucepan. Start cooking on a high heat with a little drizzle of oil. Stir it occasionally so it does not stick. Chop all the vegetables as wanted, we tend to go for big chunky pieces. Put a small saucepan on a low heat and add the sauce ingredients in order, stirring well between each. Keep stirring and bring to the boil. Take off heat and pour the sauce over the chicken then lower the heat a little. Add all the chopped vegetables. Cook boil in the bag rice as instructed now. Continue to stir the vegetables so they do not stick. As they have only been in for 10minutes they are still crisp, if you prefer softer vegetables, leave them in longer, but change when you start the rice. Divide the rice between 4 bowls, serve with lots of the sweet & sour chicken mix. Drizzle extra sauce over the top. Keep things like the prawn crackers in separate bowls. Don’t forget, Guinea Pigs will love you forever if you feed them the leftover peppers! !